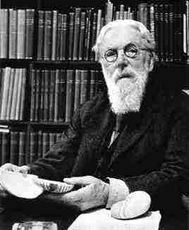 D'Arcy Thompson (May 2, 1860 – June 21, 1948) was a British biologist whose masterwork, On Growth and Form, is a profound consideration of the shapes of living things, starting from the simple premise that "everything is the way it is because it got that way." Hence one must study not only finished forms, but also the forces that moulded them: "the form of an object is a 'diagram of forces', in this sense, at least, that from it we can judge of or deduce the forces that are acting or have acted upon it." Now by "forces" Thompson meant forces, and one of his great themes is the tremendous light cast on living things by using mathematics to describe their shapes and fairly simple physics and chemistry to explain them. In other words, Thompson wrote a thousand page treatise on self-organization long before the word existed. D'Arcy Thompson found that related species superficially looking very different could in some cases be represented as simple Cartesian transformations of one another. The most thoroughly worked out modern example of this is Raup's analysis of snail shell shapes with a morphospace. 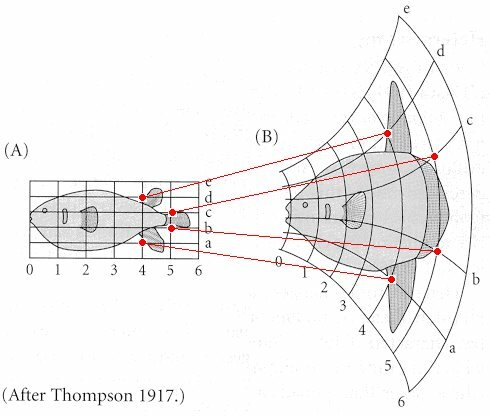 With some simplification, the axes on the fish grids in here or the snails of the morphospace can be thought of as growth gradients. The evolutionary change between the species would then have been produced by a genetic change in the regulatory mechanisms controlling those gradients. If we looked at these fish without the grids we might think that an evolutionary change from one into the other would be at least moderately complicated. The interest of D'Arcy Thompson's diagrams is then to show that shape changes could have been produced by heterochrony - a change in the rate or timing of development of some cell lines in the body relative to others. Figure: a D'Arcy Thompson transformational diagram. The shapes of two species of fish have been plotted on Cartesian grids. Image from HERE.